It’s great when a favorite beverage can actually have a beneficial effect on one of your body’s major organs. Such is the case with black tea, which is now proving itself to be a heart-healthy food. Black tea has long been a staple drink that many people both begin and end the day with. Black tea has also been a “kinder and gentler” drink for those who want to avoid the extra jolt that comes with a cup of coffee. For that, let’s turn to a recent study conducted at the School of Medicine and Pharmacology, University of Western Australia. There, researchers noted the increasing evidence for black tea polyphenols contributing to vascular health. The research team was able to prove, in fact, that regular ingestion of polyphenol-rich black tea over six months is a best natural way to lower blood pressure. However, what they hadn’t been able to show was how long or when these effects were most likely to occur. So, they set out to determine if the short-term effects of tea on blood pressure could contribute to longer-term benefits of regular tea consumption on blood pressure. Men and women were recruited to a randomized placebo-controlled trial. 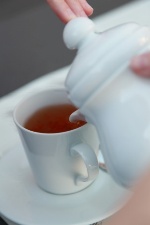 During a four-week lead-up, all participants consumed three cups per day of black tea. Participants then consumed three cups over one day of either powdered black tea solids containing 429 milligrams of polyphenols (tea), or a control product matched in flavor and caffeine content but containing no tea solids. The researchers then measured blood pressure and heart rate over the 24-hour period. They found that the 24-hour daytime and nighttime blood pressure rates were not significantly different between tea users and control subjects. However, heart rate was significantly lower for tea drinkers compared to control subjects during the nighttime and early-morning periods respectively. These results, the researchers say, suggest that the longer-term benefits of black tea to naturally lower blood pressure are unlikely to be due to short-term changes. Don’t forget to have some tea with breakfast, while at work, or after dinner. You could be doing your heart a big favor. For more on the health benefits of tea, read the article, How a Cup of Tea Could Shield Your Brain. Hodgson, J.M. et al., “Short-term effects of polyphenol-rich black tea on blood pressure in men and women,” Food Funct. October 5, 2012.